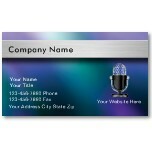 10/19/2012 Need Podcasting Business Cards? Africa Past and Present began in 2008 and contains podcasts about history, culture, and politics in Africa and the diaspora. I consider this to be one of the oldest of the new communication channels. Podcasting has been around for a while and major companies all across the globe use them to communicate with their audiences. Podcasts are typically audio recordings that sound a lot like a radio show. 10/11/2012 Need a Logo for Your Podcast Show? 10/08/2012 Not Feeling Up to Podcasting? Podcasting is an excellent and rewarding hobby, but it becomes something of a problem when there is some audio interference. Every year, I complain about fireworks, but there is also a significant issue to be had when, as hosts, you get a cold. Nasal tones, mispronunciations, sniffling and coughing do not really make for good podcasts - which means you just have to hold off on the updates, no matter how much news is emerging. A disclaimer: when it comes to communicating science, podcasting is my medium of choice. Though I have more recently made forays into writing, editing and public demonstrating, for me the draw of a live microphone and the prospect of a late night editing session cannot be beaten.